Charity in truth or truth in charity? This is the conundrum the more 300 delegates of the 133 associations under the Caritas Internationalis (CI) umbrella who voted May 14 for their new president. In the first general assembly that took place after the reform of the CI statutes, the delegates had to choose between two options. The first: is worthwhile to continue along the conventional pathway and further strengthen the bond between CI and the Holy See in order to maintain a centralized organization and a shared identity? The second: is it more useful to go out further toward the peripheries, toward the poor, and in this way in a certain sense become the guide for bishops in area of difficulties? The election of Cardinal Luis Antonio Tagle proved that the second option won. The backstory of this election, however, must be examined in the context of curial reform. A vast majority of delegates elected Cardinal Tagle as Caritas Internationalis president: out of 133 organizations under the Caritas umbrella, 91 voted for the Filipino Cardinal, who has become the first Asian Caritas Internationalis president. This choice is in continuity with the work carried on by Cardinal Oscar Andrés Rodriguez Maradiaga, who has served for two terms as CI president. Like Cardinal Rodriguez, Cardinal Tagle hails from a peripheral Church, where he is highly appreciated because of his human touch and his closeness to population. During these months of silent campaigning, his supporters spread the word that he was an advocate for the marginalized and a mediator with the Filipino government for the defense of peasants. As soon as the news of his election spread, Fr. Edu Gariguez, president of Caritas Philippines, wanted to make it immediately clear that his organization started the “clamor” for the Archbishop of Manila’s run for the presidency. Cardinal Tagle spoke on the phone to the assembly, and said he accepted the post “in the name of the poor.” Cardinal Rodriguez was quite satisfied: Cardinal Tagle’s election is also ultimately his personal success. With the new statutes, issued via Benedict XVI’s motu proprio in 2012, the competencies of Caritas Internationalis were better outlined, and a juridical framework that strengthened the organization’s link with the Holy See was provided. The issuance of the new statutes was part of Benedict XVI’s plans for the reform of Catholic charity organizations that also led to a motu proprio on diocesan charities. Pope Francis may complete this path toward reform when he establishes the much anticipated super Congregation for Charity, Justice and Peace. A reform was needed. The association of ever more bodies around a central structure (like an NGO), fostered the anxiety that the Catholic identity of Caritas Internationalis could be lost. The organization’s goal of providing social assistance risked watering down its clear representation of Church teachings. This is how CI was involved in (and, according to some, also included in) the Social Forum – a leftist organization that includes advocates for the poor, but also pro-abortion groups. CI also allegedly welcomed under its umbrella association pro-choice advocates thanks to its former General Secretary, Lesley Ann-Knight, whose work Cardinal Rodriguez strongly defended. Michel Roy’s election as the new General Secretary in 2011, and the new statutes promulgated in 2012, marked the new orientation of the organization. With Pope Francis’election, Cardinal Rodriguez started patiently building his network. He backed the Pope’s meeting with popular movements, many of which are part of the Social Forum, and this move helped him to show that Caritas Internationalis indeed had anticipated the times and that the accusation that it was not taking sufficiently into account consideration of its Catholic identity was false. That preparation for this past week’s General Assembly was based on the notion of “A Poor Church for the Poor,” was amply demonstrated by the invitation extended to Fr. Gustavo Gutierrez, a father of Liberation Theology, as one of the guest speakers. The Assembly’s theme – “One human family caring for creation” – drew CI into environmental issues that will be hot topics in view of the coming papal encyclical on ecology. In his opening address Cardinal Rodriguez also praised Pope Paul VI and Bishop Oscar Romero as inspirers of this assembly – and Archbishop Romero has been also proclaimed co-patron of the organization – thereby placing on the same level the pope who initiated the reform of charity and the South American bishop who was who was victim of an extrajudicial death squad in San Salvador. Center and periphery were thus linked together: a smart move. Caritas Internationalis delegates got the message, and gave Cardinal “Chito” – as he loves to be called – a huge majority, thus signaling which line they were going to follow. The discussion was wide. The other candidate was Youssef Soueif, Maronite Archbishop of Cyprus. Endorsed by European agencies and implicitly by Cardinal Petr Erdo, general relator of the Synod of Bishops and president of the Council for European Bishops Conference, Archbishop Soueif’s program zeroed in on the need to accomplish further reform in Caritas Internationalis. Living in Cyprus, he could have travelled to Rome often. The fact that he is involved in a European institution (he is a member of the Commission of the Bishops’ Conferences of the European Community) made him aware of European challenges, where a hidden persecution is carried on. The fact he came from a suffering Church like the Cypriot one, and that he was of the Maronite rite, made him the ideal bridge between East and West. Delegates dismissed the proposals, and there seemed to be a push to get back to a less “Catholic”, more indiscriminate gathering. During a break in the assembly, Cardinal Rodriguez told that the World Bank had asked to be welcomed within the Caritas Internationalis Organization. Kim, the World Bank president, is a doctor who is facing many problems within the organization, and is exploiting his relation with the Holy See (better, with the popular Pope Francis) to gain credibility. In the end, the knot is always the same: charity in truth, or truth in charity? Is charity or truth in the lead? These are the two poles of the debate. It is worth reporting this discussion because it isalso going on in the universal Churchin these terms: shouldthe peripheries take the lead over Rome, or should Rome provide doctrinal directives while at the same time upholding the principle of subsidiarity in regard to local churches and to their charitable organizations? Discussions over curial reform focus on this question. Those who were pushing for a revolutionary reform must take into account the reality of the facts, that is, that the “media papacy” whose narrative they fostered does not exist. Meanwhile, the hidden Vatican helped the Pope to understand that a central coordinating body in the Church is useful and needed. The institution provides freedom and also a unity that could not be experienced if all the power was devolved to local churches. The Pope is becoming more aware of this, and this is the reason that the discussions in the Council of Cardinals are stalled, just as their curial reforms are stalled. 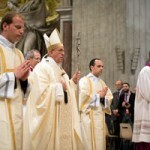 Cardinal Rodriguez, who is also the coordinator of the Council of Cardinals, tried to force the path to reforms. He stated in an interview that Pope Francis will “accomplish curial reform” but he also underscored that “the Pope does not want to fire Vatican employees, and this is the reason that time is needed: they cannot be put out on the street.” The Cardinal made particular mention of Italian employees, as if dysfunction depends upon nationality. He also added that the first super congregation to be established will be that of “Laity, Family and Life,” not by chance the Congregation he is tipped to take over. This way, the Congregation for Charity, Justice and Peace would be in a sort of stand-by status for a while, while Caritas Internationalis has all the time necessary to become a global pulpit, thanks to the rising star of Cardinal Tagle, a possible frontrunner in the next conclave. The progressive wing likes Cardinal Tagle very much, and appreciates the fact that he is part of the editorial committee of the so-called “School of Bologna” that is committed to writing a history of the Second Vatican Council, interpreting it as a rupture with the past – and not according to the hermeneutic of continuity promoted by Benedict XVI. 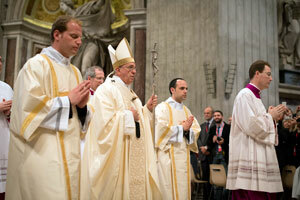 Cardinal Tagle’s election is thus interpreted as a break with the institutional efforts promoted by Benedict XVI. But saying that Cardinal Tagle is the “Asian Pope Francis” would also represent a contrived interpretation of facts. Suspended as he is between the media pontificate and the real pontificate, Pope Francis has always understood the need to balance the barque of Peter. He spoke about family and gender in terms and with a force that nobody would have imagined at the outset of his pontificate. He appreciated Cardinal Ludwig Mueller’s recommendations, who – as the ‘guardian of faith’ – sent Pope Francis some critical remarks, and also made a timely, public intervention, often writing articles for L’Osservatore Romano, the Vatican newspaper. Among his articles, two are noteworthy: that on the pastoral discipline concerning divorced and civilly remarried, and that on theological roots of curial reform. The Pope did not shove these articles in a drawer, but carefully read and appraised them. Archbishop Fernandez insisted on the fact that the Pope must and could decide everything by himself, while Cardinal Rodriguez justified the stall in reforms with the Papal will not to fire people. Both act as though they are trying to get a final hook in the Pope in order to carry forward a revolution that, after all, seems not to be taking place. Pope Francis has a political instinct; after two years of his pontificate he understands that the Roman Curia is not a useless structure, and that it does not oppose his preaching in favor of “a poor Church for the poor” or his invitation to go toward peripheries.” On the contrary, the Curia is a tool to achieve the Pope’s vision. Some reforms are certainly needed, and Benedict XVI was quite aware of this, too. In fact, every Pope has tried to ameliorate the functioning of the Curia, and each of them has struggled with internal problems. This does not mean that everything needs to be dismantled. The Pope seems to have become aware of this. The pushing from the progressive wing, on the other hand, seems to be part of a campaign not to lose the pontificate that it projected and built. But will the real pontificate win over the media pontificate? 2 Responses to Pope Francis, Charity in Truth or Truth in Charity? Let’s hope that the reform of the Curia is all about getting rid of the few but hazardous bad apples… indirectly, not head on. Smoke and mirrors. If all goes well, it will become evident that Pope Franis is a master snake charmer. Snakes need to be charmed so that they don’t bite while you box them up.